The best way to sum up this publication is that if Militaria and History are your subjects then this is the best souce published on the subject in English. It is not in the French Militaria style. Its 80 pages encompass nearly all the contact information you could ever wish about dealers, fairs and private sales. There are several long running series and these are proving to be a very useful reference library in their own right, the 18pdr field gun and the Riddle of the Marne in particular. It also has useful tips on detecting fakes and is very much up to date on the latest to be offered to the unsuspecting or novice collector. 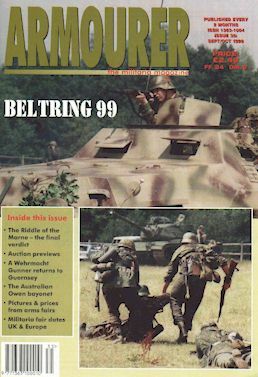 In all the time I have been collecting the magazine it has always increased my knowledge of uniforms and equipment and each edition has the few odd surprises. This edition has a very good article on the Australian Owen Bayonet. I look forward to it and it has that feel of being an old friend now. I recommend it to all those who study Military Uniforms Equipment and History. Go out and buy it now.